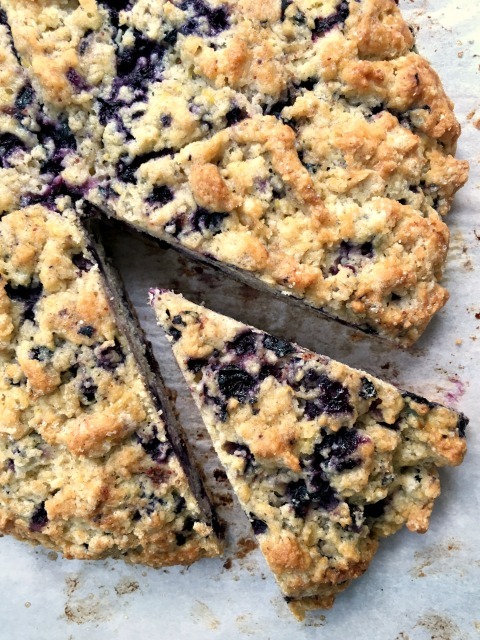 Wholegrain Lemon Blueberry Scones are wholesome made with stone ground flour and a full cup and a half of blueberries. The other night an acquaintance was telling me how, years back, she and her husband had a friend who baked scones every Sunday morning as an open invitation for friends to stop by for a light breakfast and conversation. He made enough scones for everyone to have two and if more people showed up he’d head back into the kitchen to make another batch. I have always thought that weekend mornings are the best time for scones. When there’s time to enjoy them right out of the oven, still hot enough to melt the butter. 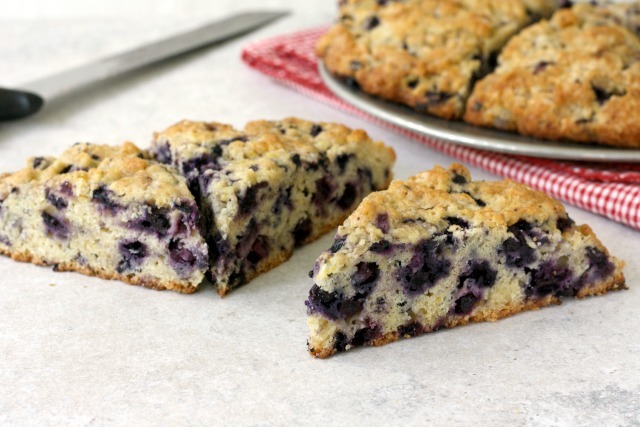 While there are still a few summer weekends to enjoy, make these scones with fresh blueberries. The recipe works well with frozen berries too, so you can enjoy them year round. I can’t remember where I found the recipe but I have been making them for at least 20 years. May be one of these days I start the same Sunday morning tradition. Cut in cold butter until it’s pea sized. Stir in blueberries and lemon zest. Make a well in the middle if the dry ingredients and pour in the beaten eggs and cream. Place on prepared pan and gently pat into a circle about an inch thick. Score into 8 wedges and sprinkle with a little sugar. Bake for 30-35 minutes, until golden on the edges and it springs back lightly when touched in the middle. Cool for a few minutes before cutting into wedges and slathering with butter. Have you tried frozen blueberries in this recipe?